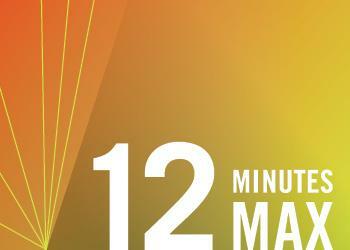 12 Minutes Max is a monthly experimental performance series featuring short works by local artists in many disciplines. One Sunday a month, we present three original pieces in a varied mix, chosen from music, dance, film, theater, performance art, writing, and the like — each 12 minutes or less. The whole event is short and sweet, taking about an hour. Following each event, we serve coffee and cookies in an informal gathering, a chance for conversation with the artists. Dance artist Molly Heller, combining efforts and 12-minute time slots with musicians Nick Foster, Mike Wall and Austin Booth, will present an excerpt from her latest body of research, Heartland. Born from night club practices, this work explores moving from the physical spaces of the heart in an attempt to locate one's self. Heartland is a series of individual studies and pop up events. Molly teaches at the U of U’s School of Dance; Nick, Mike and Austin all play with the Salt Lake Electric Ensemble. Elaine Clark, Will Bagley, and Ainsley Romero will present the short, animated film Survivor, in which we meet Margaret Dalglish ... a bad-a pioneer woman. The film was made by KUER’s RadioWest. Ainsley Romero animated the film; she’s a graphic designer and illustrator from Austin, Texas currently studying at Brigham Young University. Will Bagley narrates Survivor; he’s written way too many books on Western History — more than two dozen — and has been a fellow of the Utah State Historical Society since 2014. Elaine Clark is a history nerd who produces radio and film for KUER’s RadioWest. This program is modeled after 12 Minutes Max, a performance laboratory originated by On the Boards in Seattle.